The inaugural season of Netflix’s Chilling Adventures of Sabrina drops this Friday, October 26, just in time for Halloween. Two days ahead of its premiere, the show’s official Twitter account has posted the opening credits sequence, which you can check out below. Chilling Adventures of Sabrina‘s artwork in the clip was lifted directly from the comic book series that inspired it. However, Robert Hack’s original character designs have understandably been tweaked, to better match the actors portraying the characters. When the credits reference the character’s ’60s origins, however, a panel is shown from the original Archie Comics. This sequence also gives us our first listen to the new series’ theme music. Unlike the buoyant, guitar-based intro from the ’90s sitcom, this new theme instills a mood that is significantly darker. With fast-paced violins and a heavy dose of Theremin, the composition hearkens back to several beloved horror films from the ‘70s and ‘80s. Early reactions to Chilling Adventures of Sabrina have been quite positive so far. It currently holds a respectable rating of 76 on Metacritic. That indicates “generally favorable reviews.” The series was developed by the comic’s writer, Roberto Aguirre-Sacasa and stars Kiernan Shipka in the title role. Joining her on the series are Ross Lynch as Harvey Kinkle, Miranda Otto as Zelda Spellman, Lucy Davis as Hilda Spellman, Chance Perdomo as Ambrose Spellman, Michelle Gomez as Mary Wardell, and Jaz Sinclair as Rosalind Walker. 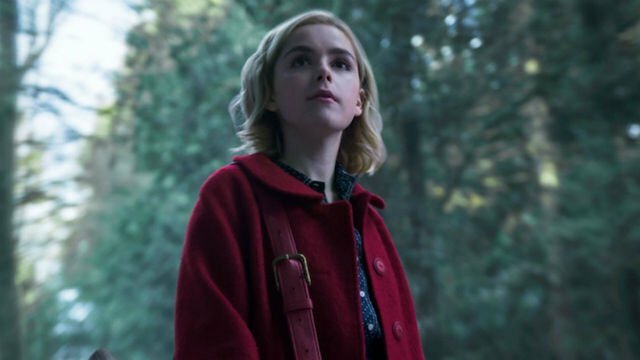 All 10 episodes of Chilling Adventures of Sabrina’s first season will be available to stream on October 26. What do you think of the show’s opening credits sequence? Let us know in the comment section below!